I got the news about the Columbian Way car but missed that they’re stealing away the Red Apple car, too! I was a Flexcar member for 4 years and had access to the New Holly car (six blocks from my house) that whole time. Zipcar took that away with no notice, supposedly after doing “significant outreach” to up use. For the last year I’ve been alternating between the Columbia City and the Columbian Way cars but only because I was no longer confined to using the bus to get to a Zipcar location. Between the lack of access to cars and the state’s rental car tax, I no longer sing the praises of car sharing. I was an enthusiastic advocate under Flexcar’s reign and happily told friends and strangers alike about how happy I was as a member. 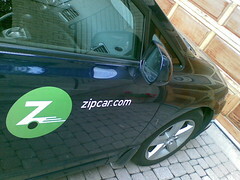 Zipcar has burned away all of that goodwill and more. What a shame. Side note: I talked with Rep. Zack Hudgins about Zipcar when he was making an appearance at the lightrail safety fair this fall (both about the rental car tax issue and the disappearing car locations south of I-90) and I recently received a letter from him stating that he was leaning on Zipcar to return the New Holly location. It might be worthwhile, if people are inclined to protest these changes, to clue Rep. Hudgins in to Zipcar’s new agenda. We found out about this via the Beacon Hill Mailing List, and Zack is on the mailing list too, so he probably already knows. It wouldn’t hurt to write him anyway, though. The Rainier Valley lost TWO Zipcars in July, and one of them was for Brighton-area seniors. Meanwhile, Zipcar – the world’s largest provider of cars on demand by the hour or day – had JUST announced record membership growth. Not cool, Zipcar. Is the Columbia City car still going to be there, or are they removing that too? This is not cool! I just signed up in November only because of the car location by Red Apple being convenient. It kind of defeats the purpose if I have to take a bus miles away to pick up. Funny they didn’t bother to alert me to this change nor decide to share this when I signed up. Especially after I confirmed multiple times with several service agents the locations and long term plans for zipcar availability. Bad business in my my opinion!